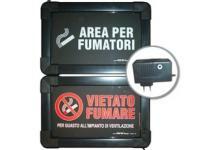 Bright or not anti-smoking signs for smoking rooms. Screen printed white forex signs framed with PVC coloured rounded profile and four ABS angles with revolving rings for wall application. Plexiglass back-screen printed signs with fluorescent inks framed with black PVC profile and four ABS angles with revolving rings for wall application.Black forex back.